Chariot SCADA is powered by Ignition, the powerful HMI, SCADA, and MES software platform from Inductive Automation providing cross-platform compatibility, unlimited free clients, robust out-of-the-box SQL database support, and fast installation. Leveraging the full power of the Ignition universal industrial automation platform with fully integrated HMI/SCADA functionality, the Chariot SCADA middleware infrastructure with Ignition define a true IIoT solution unlike any other on the market today. Ignition is the only IIoT platform with full-featured SCADA functionalities built right in. Ignition is the world’s first truly universal industrial application platform — it empowers you to connect IIoT data across your entire enterprise, rapidly develop automated systems, and scale in any way you need. Ignition is the world’s first truly universal industrial automation platform because it empowers you to connect IIoT data across your entire enterprise, rapidly develop any type of automated system, and scale your system in any way, without limits. What Makes the Ignition IIoT Solution Unique? Manufacturers around the world use Ignition to efficiently connect devices, systems, and people over the web. By plugging SCADA modules into the Ignition platform, users can add features such as charts and tables, mobile access, voice notifications for alarms, sophisticated logic systems, and many more. Now, MQTT modules specifically designed for IIoT architectures are available to deliver easy, immediate connectivity to any IIoT device on your network to unlock data previously unavailable to your SCADA system. The IIoT modules leverage all of Ignition’s unique, industry-leading platform features, which can easily connect the devices in your enterprise and viably harness data for maximum benefit. With Ignition’s unlimited licensing model, you can affordably collect and process massive amounts of data and scale out your system. Like all Ignition modules, the IIoT modules can be installed, removed, and upgraded without impacting operations or affecting the rest of the system. Ignition is the ideal platform for making the IIoT a reality. It has three core elements in particular that set it apart as an IIoT platform: open connectivity, unlimited storage, and agile applications. 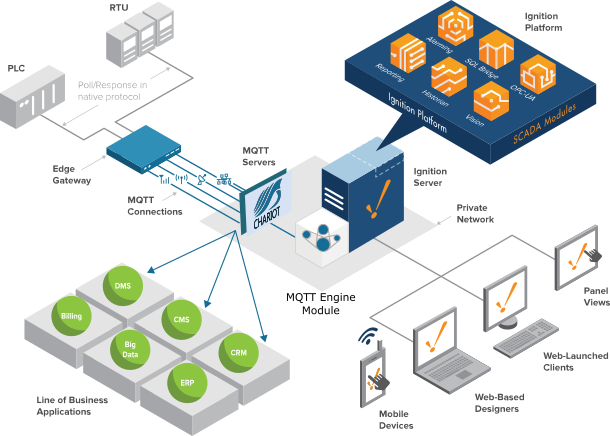 Open Connectivity: Ignition’s integrated OPC Unified Architecture (OPC-UA) server provides near-seamless connectivity to hundreds of protocols. Its open application programming interface (API) facilitates interaction and data-sharing between applications, and the development of drivers for protocols such as MQTT. Unlimited Storage: Ignition leads the industry in database accessibility and utilization by unlocking the power, speed, ease of use, flexibility, and superior economics of SQL databases. The ability to use Ignition at any scale — whether embedding on a machine or hosting it in the Cloud — gives you wide latitude to scale your data storage. Agile Applications: Ignition provides the tools to build agile applications that get collected data to the right people quickly. Ignition removes the obstacles of slow development, limits on user seats and data access, and unmanageable deployment with its unlimited user seats and data, and super-fast application development and deployment. Ignition is the only unified SCADA and IIoT platform that empowers your enterprise to actualize the potential of the IIoT by rapidly developing, deploying, upgrading, improving, and scaling solutions. This is why Ignition is the world’s first universal industrial automation platform.